A few weeks ago I got a set of alarms from the guys at ATT. I’d been in the market for a new set for a while, and talking to several of my mates the word on the street was that these alarms were the best on the market, and they also happen to look the coolest. So once I’d spoken to Danny about what I required, it was with huge anticipation that I waited for the postman to arrive. I knew that the units were compact, but I was actually surprised how small they were. With the amount of nifty features it makes you wonder how they get it all into such a small package. 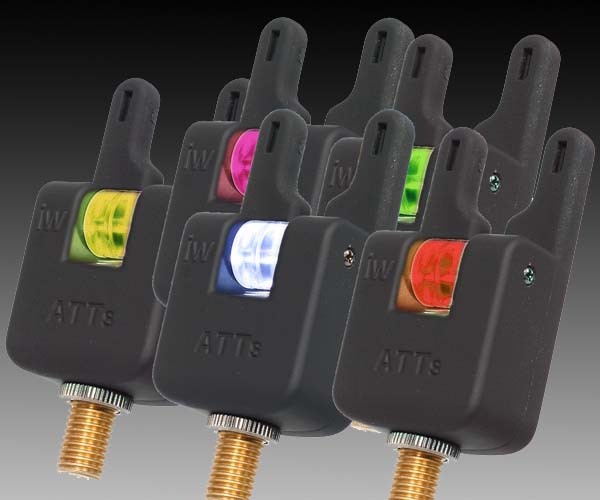 I’d asked for the ATTs IW heads in blue, and they are great. The blue, to my eyes stands out best both day and night, as it’s not a colour you usually see in nature. Alarms have certainly come a long way since the first Optonics with a separate white sounder box. The heads despite their compact size hold the rod very well, the “ears”, seem high enough to prevent the rod getting pulled out on the take, which means I can’t see the need for the current trend of using high snag ears. ATT do actually make a replacement extended back which, if this was a problem would negate the need for separate snag ears. I really love the discreet nature of the system. I can turn it right down and no one else on the lake is bothered by my alarms. The heads come with a rubber cover which looks like it really should protect them and which has a brilliant feature of incorporating the On/Off switch. One of my biggest bug bears with my Fox Microns was that I used to forget to switch them on. I don’t like having my buzzers bleeping all over the place so I switch off when adjusting my hangers. But I often forget to put one or more back on… Guess it’s age.. LOL!! Anyway no worries here. Also when I put them away I no longer have a problem with forgetting to switch them off, or having them switch on in transit. No more beeping rucksacks. They are delivered with a two magnet roller, which so far has been perfect for my fishing, and seems sensitive enough, although a four magnet version is available. Everything on the remote is piloted by three buttons. Very neat and simple. Now these heads are designed to be silent and the remote receiver is the only bit that sounds. The unit is also very compact and mine was delivered with a neck chord and neoprene case to protect it. It also has a hook on the back, which is great for hooking it onto a rib or my brolly. Mine were already tuned in, but looking at the videos online the set up is really simple. There is a whole host of tones, and you can tune in upto ten heads to one receiver. A nice feature if you have say, two set ups, one pod and one on bank sticks, it means you don’t need 2 receivers. 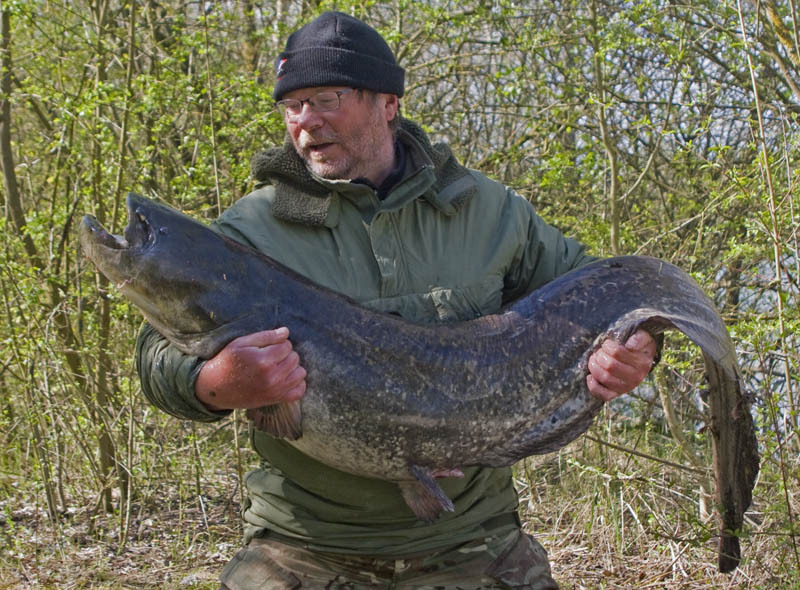 First fish I caught with the ATT system was this 64lb catfish. Having never used an alarm with a remote before, I was a bit dubious about having just the receiver giving me the indication of a run, but once you’re fishing and the buzzer sounds it makes no difference. I really love the discreet nature of the system. If I put the remote around my neck, I can turn it right down and no one else on the lake is bothered by my alarms. For even more discretion the unit has a vibration setting, like a mobile phone. A nice touch, but I can see myself diving for the phone and not the rods if I activated that. Everything on the remote is piloted by three buttons. Very neat and simple. There is a line of LED’s which let you know which rod is going, But I must admit so far I’ve not looked at them, other than to see them light up as a signal that the remote is working when you switch it on. A one toner sees me dive for the rods every time. The remote receiver takes 2 AA batteries, which are easy to find. I’ve yet to see if the stated battery life is accurate. Also I don’t know how long the watch type battery in the heads lasts. Time will tell I suppose depending on the use the system gets. 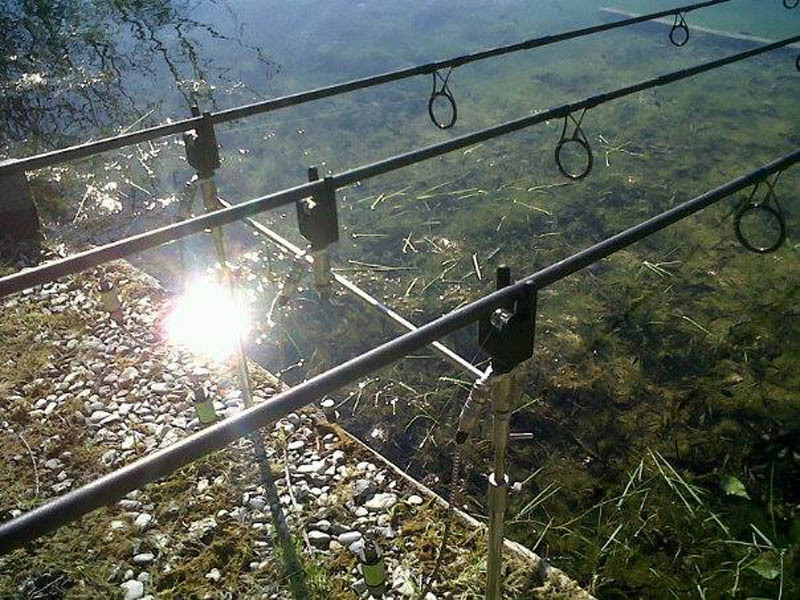 This entry was posted in Reviews and tagged Advanced Tackle Technology, Alarms, angling, ATT, ATTs, ATTx, boilies, buzzers, carp, Carp Fishing, commons, croix blanche, fish, fishing, floaters, france, french, french carp, gardner, lake, lakes, nature, reims, summer, surface, tackle, venue, waters, weather. Bookmark the permalink.